In the mid-80s, Shaw established Fun City Tattoo on Macdougal Street, before moving it to Saint Mark’s Place in 1989. Though it had a long way to go in terms of gang violence, by the late 80s, the East Village had transformed into a cultural mecca. And with it came the inevitable tides of gentrification, culminating with the Tompkins Square riots in 1988. In 2001, a young apprentice of Shaw’s nicknamed Big Steve started off as a shop boy at Fun City. 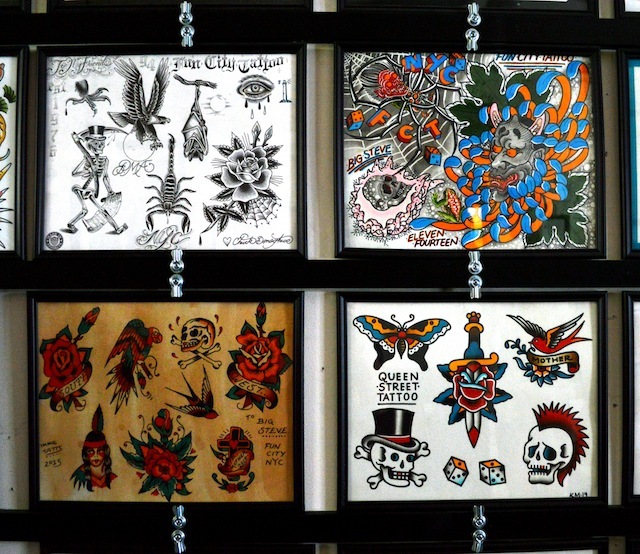 At a time when tattooing was exploding as an international art-form, and still very old-school and competitive where trade secrets were hard to come by, Steve was on the ground floor, learning from the very master who had orchestrated its cultural renaissance. Steve quickly gained fame on the tattoo circuit with a diverse style drawing heavily on traditional Americana, miniature work, traditional Japanese minimalism, and black and grey imagery. Fun City Tattoo flash sheets.